Home > Departments > Faculty > Youjin Chung Ph.D. 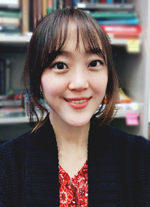 Professor Youjin Chung joined the faculty in the Graduate School of Geography in Fall 2018. She received her Ph.D. and M.Sc. in Development Sociology from Cornell University, an M.Phil. in Development Studies from the University of Cambridge, Jesus College, and a Dual B.A. in International Studies, and Journalism and Communication from Korea University. Her research program is broadly concerned with the relationship between development, gender and intersectionality, and agrarian/ecological change in Eastern and Southern Africa, particularly Tanzania. She is interested in how and in what ways rural livelihoods and lifestyles articulate with local and global capitalist forces, and how these relational processes (re)shape people's multidimensional identities/subjectivities and their relationships with the state, society, and the environment. Her current work examines the contested agrarian politics surrounding a stalled land deal in coastal Tanzania through the lens of postcolonial intersectionality. Professor Chung teaches GEOG 136 Gender and Environment.